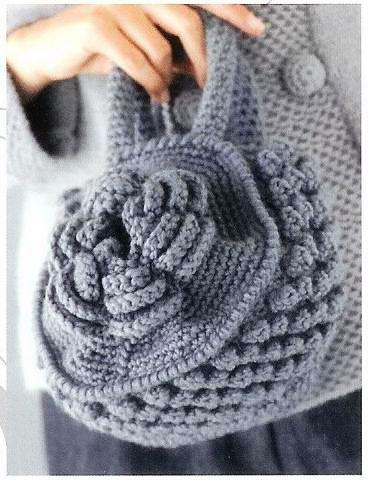 This bag in crochet is wonderful. So elegant that looks good with any outfit! 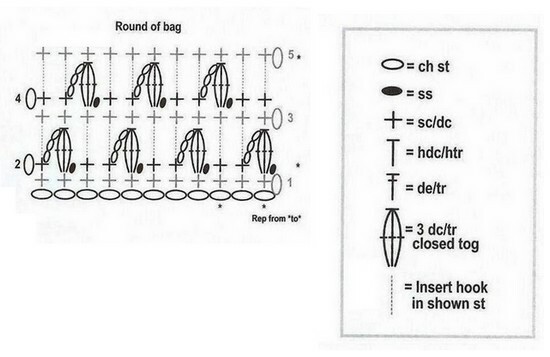 See the diagram and make your bag … good crochet! LAINES BOUTON D’OR LAÏKA, Gris Silex 1067: 7 balls. UK, single crochet (sc) US/double crochet (dc)UK, crab st *…*: rep between * as many times as indicated, otherwise till the end of the row. 3 dc/tr closed tog: *yrh, insert hook in 1 st, yrh, draw a loop, yrh, draw through 2 loops* 3 times, yrh, draw through the 4 loops on hook. The first round measures 1 1/8 in/3 cm in diameter. Back and front measure 7 3/4 in/20 cm in diameter. Crochet back and front foll drawing. Ch 11 (= 3 1/2 in/9 cm in width), crochet foil drawing. At 18 1/8 in/44 cm from beg fasten off. Crochet 1 row sc/dc each side of round. 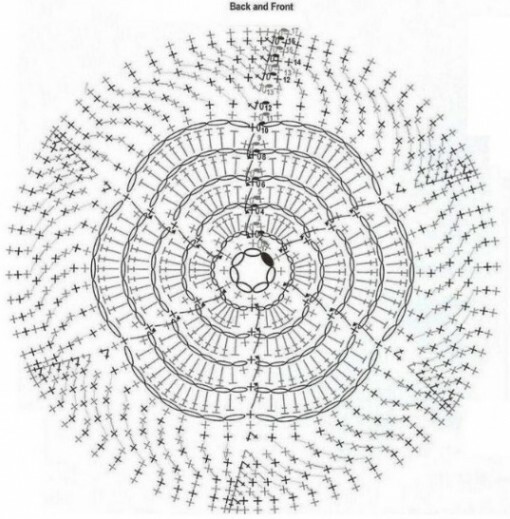 Ch 8 sts, close into a ring with a ss, work sc/dc in spiral. At 10 1/4 in/26 cm from beg fasten off. Crochet another handle to match. Join back and front to the round of the bag working sc/dc as foll: insert hook in 1loop of the ss row of round and 1 loop of the last sc/dc row of back and front, then crochet 1 row crab st all around the back, the front and both ends ot the round. Stuff the handles, then sew them inside the bag.